I thought this was delicious! I did it a little differently though. I layered it this way: eggplant, parmesan, tomato, pepperjack cheese and topped with basil. This is a great variation. 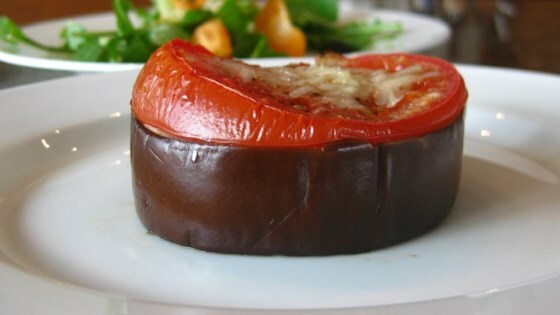 This was a good way to use eggplant, although the recipe should note the eggplant should be peeled. Scrumptious! I took the advice of some others and added spinach, mozzarella and fresh basil on top. This is definitely a keeper!